3.8.1. My Lisa has an I/O board that has a four pack of NiCAD AA batteries, what should I do? You should immediately remove the batteries! If they haven't already leaked, you are very, very lucky. Most of these are very old and the batteries have leaked, usually damaging the board with corrosion! There is little value to replacing these batteries with new ones, as good ones will only maintain the time for a few hours while the Lisa is unplugged. This is probably why the I/O board used in the Lisa 2/10 does not have backup batteries. It is perfectly fine to run a Lisa without these batteries, all they do is maintain power to the floppy RAM (which contains the equivalent of the Mac's PRAM) and the real time clock in the COP421. This will be maintained just fine as long as the Lisa is plugged in to power, even though the Lisa is turned off. That said, the real time clock may be useless as it's range is from 1980 to 1995 (unless you are using an updated version of MacWorks Plus II), and unless you are using your Lisa regularly, you are better off not leaving your Lisa plugged into power where it can be exposed to possible brown outs and power surges. You should also plug your Lisa into a very good power surge protection unit when using it, and leave it unplugged when not in use for an extended period. More than likely, if you are reading this question, it's already too late and the NiCAD batteries have leaked. You have a few options. You can try to find a replacement I/O board, or attempt to repair your current I/O board. I found the following web pages pages that address this type of repair. The last link in the list is a failed repair attempt. YMMV. Instead, try to clean up as much of the damage with an old toothbrush. Be careful not to breathe in any of the dust. Look at the traces on the board, if any of them are damaged, you'll see a blueish green coating that's different from the board's own lacquer on the solder points, the traces may be raised up or puffed up, or even broken, you should clean the solder points between the traces, then reflow them using a soldering iron. After doing so, use an Ohm-meter, check for continuity. If the resistance is still high (more than a few Ohms), solder another wire across the solder points of the traces to replace the corroded ones. Be careful not to cause a short circuit. You may also have to replace any components damaged by the leak, and any damaged by short circuits caused by the leak. In my own case, I had to replace a VIA chip and a COP421 chip because the VIA chip had a bit of melted plastic. I replaced the COP421 chip because the mouse did not work on with this I/O board, but did with another. COP421 chips are very difficult to find, their only sources are other Lisa I/O boards. According to the Lisa Hardware Guide there are identical COP421 chips inside the Lisa's keyboard, however, no keyboard that I've come across has these. Instead, they are Intel keyboard controller chips. If you have a dead, extra keyboard that has a COP421, you can try to swap the keyboard COP421 with the one on the I/O board. Please let me know if you find such a keyboard. I suspect these were only in the prototypes or very eary keyboards. If you are able to locate a Mac XL I/O board (does not have an AM9512 socket, has a large IWM chip) and does not have NiCAD batteries or a switch, you can attempt to use this board. However, you'll also need a Lisa XL motherboard, and you should not use the LisaLite floppy adapter with it. I had suggested that Ray use diluted vinegar to remove the blue stuff on the basis of many well respected postings from a calculator site: http://www.hpmuseum.org. Apparently the leakage from NiCAD batteries is alkaline. A weak acid will help to neutralize this, whereas neutral water will only dilute it. 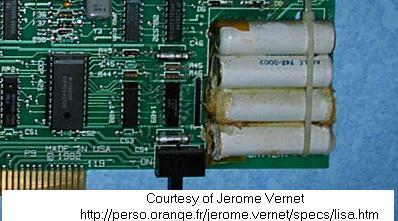 Unless the leakage is neutralized, the corrosion will continue to spread. The question is then, how does one remove or neutralize any remaining acid? After washing with water, I suggest using a circuit board flux remover, as they are designed for compatibility with circuit boards, and for removing acid residues of some soldering fluxes. Flux remover comes in a range of formulas and strengths, I suggest one of the alcohol based formulas, as these tend to be safer to use on plastics and have low toxicity. In a pinch, 99% pure isopropyl alcohol (at your local pharmacy) can be used instead, but this may leave a white residue. Flux removers are available in pressurized cans that makes it easier to clean under components. To avoid spreading the corrosion, hold the board with the battery corner down so that you don't need to wash more than necessary. Remove the solder from any joints that appear affected, and clean before resoldering. When cleaning, make sure you get under any ICs and resistors that are near the corrosion, as well as into any holes that go through the board. I have used the above technique, and it appears to have been successful at stopping the corrosion.